FileSourceScanExec is a leaf physical operator (as a DataSourceScanExec) that represents a scan over collections of files (incl. Hive tables). FileSourceScanExec is created exclusively for a LogicalRelation logical operator with a HadoopFsRelation when FileSourceStrategy execution planning strategy is executed. FileSourceScanExec supports bucket pruning so it only scans the bucket files required for a query.
} yield s"Bucket $bucketId => $f"
FileSourceScanExec uses a HashPartitioning or the default UnknownPartitioning as the output partitioning scheme. FileSourceScanExec is a ColumnarBatchScan and supports batch decoding only when the FileFormat (of the HadoopFsRelation) supports it. FileSourceScanExec always gives the single inputRDD as the only RDD of internal rows (in Whole-Stage Java Code Generation). FileSourceScanExec supports data source filters that are printed out to the console (at INFO logging level) and available as metadata (e.g. in web UI or explain). As a DataSourceScanExec, FileSourceScanExec uses Scan for the prefix of the node name. FileSourceScanExec uses File for nodeNamePrefix (that is used for the simple node description in query plans). metadata is part of DataSourceScanExec Contract to..FIXME. Enable INFO logging level to see pushedDownFilters printed out to the console. Enable ALL logging level for org.apache.spark.sql.execution.FileSourceScanExec logger to see what happens inside. createNonBucketedReadRDD sums up the size of all the files (with the extra spark.sql.files.openCostInBytes) for the given selectedPartitions and divides the sum by the "default parallelism" (i.e. number of CPU cores assigned to a Spark application) that gives bytesPerCore. The maximum size of partitions is then the minimum of spark.sql.files.maxPartitionBytes and the bigger of spark.sql.files.openCostInBytes and the bytesPerCore. Planning scan with bin packing, max size: [maxSplitBytes] bytes, open cost is considered as scanning [openCostInBytes] bytes. For every file (as Hadoop’s FileStatus) in every partition (as PartitionDirectory in the given selectedPartitions), createNonBucketedReadRDD gets the HDFS block locations to create PartitionedFiles (possibly split per the maximum size of partitions if the FileFormat of the HadoopFsRelation is splittable). The partitioned files are then sorted by number of bytes to read (aka split size) in decreasing order (from the largest to the smallest). createNonBucketedReadRDD "compresses" multiple splits per partition if together they are smaller than the maxSplitBytes ("Next Fit Decreasing") that gives the necessary partitions (FilePartition). In the end, createNonBucketedReadRDD creates a FileScanRDD (with the given (PartitionedFile) ⇒ Iterator[InternalRow] read function and the partitions). createNonBucketedReadRDD is used exclusively when FileSourceScanExec physical operator is requested for the input RDD (and neither the optional bucketing specification of the HadoopFsRelation is defined nor bucketing is enabled). FileSourceScanExec initializes the internal registries and counters. outputPartitioning is part of the SparkPlan Contract to specify output data partitioning. createBucketedReadRDD maps the available files of the input selectedPartitions into PartitionedFiles. For every file, createBucketedReadRDD getBlockLocations and getBlockHosts. createBucketedReadRDD then groups the PartitionedFiles by bucket ID. Bucket ID is of the format _0000n, i.e. the bucket ID prefixed with up to four 0s. createBucketedReadRDD prunes (filters out) the bucket files for the bucket IDs that are not listed in the bucket IDs for bucket pruning. createBucketedReadRDD creates a FilePartition for every bucket ID and the (pruned) bucket PartitionedFiles. Use RDD.toDebugString to see FileScanRDD in the RDD execution plan (aka RDD lineage). createBucketedReadRDD is used exclusively when FileSourceScanExec physical operator is requested for the inputRDD (and the optional bucketing specification of the HadoopFsRelation is defined and bucketing is enabled). supportsBatch is part of the ColumnarBatchScan Contract to enable vectorized decoding. supportsBatch is enabled (i.e. true) only when the FileFormat (of the HadoopFsRelation) supports vectorized decoding. Otherwise, supportsBatch is disabled (i.e. false). FileSourceScanExec has needsUnsafeRowConversion flag enabled for ParquetFileFormat data sources exclusively. needsUnsafeRowConversion is part of ColumnarBatchScan Contract to control the name of the variable for an input row while generating the Java source code to consume generated columns or row from a physical operator. Otherwise, needsUnsafeRowConversion is disabled (i.e. false). needsUnsafeRowConversion is used when FileSourceScanExec is executed (and supportsBatch flag is off). vectorTypes is part of ColumnarBatchScan Contract to..FIXME. vectorTypes simply requests the FileFormat of the HadoopFsRelation for vectorTypes. If supportsBatch is on, doExecute creates a WholeStageCodegenExec (with codegenStageId as 0) and executes it right after. If supportsBatch is off, doExecute creates an unsafeRows RDD to scan over which is different per needsUnsafeRowConversion flag. Otherwise, doExecute simply takes the inputRDD as the unsafeRows RDD (with no changes). doExecute takes the numOutputRows metric and creates a new RDD by mapping every element in the unsafeRows and incrementing the numOutputRows metric. Use RDD.toDebugString to review the RDD lineage and "reverse-engineer" the values of the supportsBatch and needsUnsafeRowConversion flags given the number of RDDs. With supportsBatch off and needsUnsafeRowConversion on you should see two more RDDs in the RDD lineage. inputRDD is an input RDD of internal binary rows (i.e. InternalRow) that is used when FileSourceScanExec physical operator is requested for inputRDDs and execution. When created, inputRDD requests HadoopFsRelation to get the underlying FileFormat that is in turn requested to build a data reader with partition column values appended (with the input parameters from the properties of HadoopFsRelation and pushedDownFilters). In case HadoopFsRelation has bucketing specification defined and bucketing support is enabled, inputRDD creates a FileScanRDD with bucketing (with the bucketing specification, the reader, selectedPartitions and the HadoopFsRelation itself). Otherwise, inputRDD createNonBucketedReadRDD. createBucketedReadRDD accepts a bucketing specification while createNonBucketedReadRDD does not. 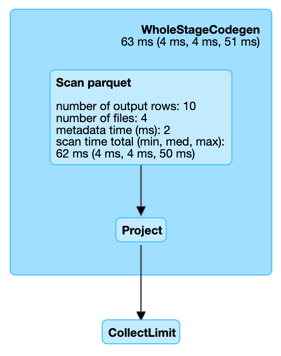 outputOrdering is part of the SparkPlan Contract to specify output data ordering. Otherwise, outputOrdering is simply empty (Nil). In the end, updateDriverMetrics requests the SQLMetrics object to posts the metric updates. updateDriverMetrics is used exclusively when FileSourceScanExec physical operator is requested for the input RDD (the very first time).